Tufted gathered cushions for optimum comfort. Curved design helps reduce back pain. Solid base provides more stability. Contemporary styling with tufted, gathered cushions for optimum comfort. Durable polyurethane loop arms. Five-star black nylon base with casters. Casters supplied with the chairs are not suitable for all floor types. Alternative casters are available to meet your specific needs. Comfortable ergonomic seating. Curved high back. Pneumatic seat height adjustment. 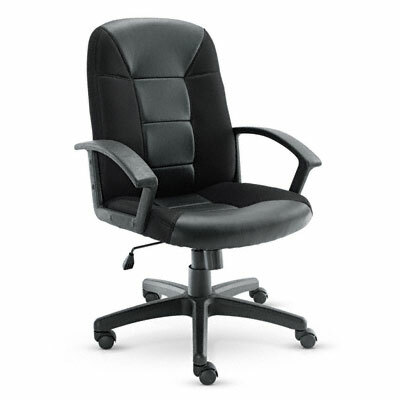 360° swivel, tilt tension and tilt lock controls. Black split leather/mesh fabric.